This is a scalable context timeline. It contains events related to the event 1993: Darkazanli Gives CIA First Hint of Al-Qaeda Cell in Hamburg. You can narrow or broaden the context of this timeline by adjusting the zoom level. The lower the scale, the more relevant the items on average will be, while the higher the scale, the less relevant the items, on average, will be. 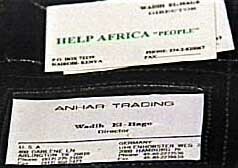 On top is El-HageÃ¢Â€Â™s business card for his fake charity, Help Africa People. Below is his card for his business Anhar Trading. On the lower left is a US address and on the lower right is DarkazanliÃ¢Â€Â™s address in Germany. [Source: CNN]The CIA first became interested in Mamoun Darkazanli in 1993 (see 1993). 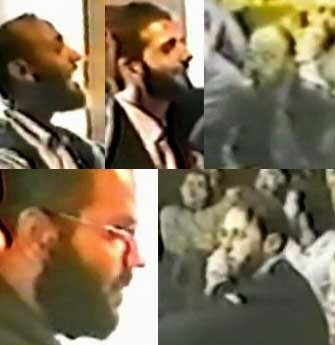 The FBI shows interest in Darkazanli after al-Qaeda operatives Wadih El Hage and Mamdouh Mahmud Salim (a.k.a. Abu Hajer) are arrested in late 1998 (see September 16, 1998-September 5, 2001 and September 16, 1998). According to FBI documents, Darkazanli’s fax and telephone numbers are discovered in El Hage’s address book. Darkazanli’s Deutsche Bank account number is found in the book as well. [CNN, 10/16/2001] El-Hage had created a number of shell companies as fronts for al-Qaeda activities, and one of these uses the address of Darkazanli’s apartment. [Chicago Tribune, 11/17/2002] Further, El-Hage’s business card shows Darkazanli’s Hamburg address. The FBI also discovers that Darkazanli has power of attorney over a bank account belonging to Salim, a high-ranking al-Qaeda member. El Hage will later be convicted for his role in the 1998 US embassy bombings, and Salim will remain in US custody. [New York Times, 6/20/2002; US Congress, 7/24/2003, pp. 157 ] By this time, Darkazanli is associating with members of the Hamburg al-Qaeda cell, and may be a member of the cell himself. Mamoun Darkazanli, investigated several times starting in 1993 (see 1993; Late 1998); the CIA makes repeated efforts to turn him into an informer (see December 1999). Mohammed Haydar Zammar, investigated by Germany since at least 1997 (see 1996), the Germans periodically inform the CIA what they learn. Osama Basnan, US intelligence is informed of his connections to Islamic militants several times in early 1990s but fails to investigate (see April 1998). Omar al-Bayoumi, investigated in San Diego from 1998-1999 (see September 1998-July 1999). Anwar al-Awlaki, investigated in San Diego from 1999-2000 (see June 1999-March 2000). Osama “Sam” Mustafa, owner of a San Diego gas station, and investigated beginning in 1991 (see Autumn 2000). Ed Salamah, manager of the same gas station, and an uncooperative witness in 2000 (see Autumn 2000). An unnamed friend of Hani Hanjour, whom the FBI tries to investigate in 2001. 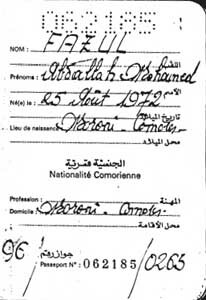 An unnamed associate of Marwan Alshehhi, investigated beginning in 1999. Hijackers Nawaf Alhazmi and Khalid Almihdhar, who had contact with Basnan, al-Bayoumi, al-Awlaki, Mustafa, and Salamah, “maintained a number of other contacts in the local Islamic community during their time in San Diego, some of whom were also known to the FBI through counterterrorist inquiries and investigations,” but details of these individuals and possible others are still classified. [US Congress, 7/24/2003 ] None of the above people have been arrested or even publicly charged with any crime associated with terrorism, although Zammar is in prison in Syria.